Posterior tibial tendon dysfunction (PTTD) is an inflammation and / or overstretching of the posterior tibial tendon in the foot. An important function of the posterior tibial tendon is to help support the arch. But in PTTD, the tendon’s ability to perform that job is impaired, often resulting in a flattening of the foot. PTTD is often called adult-acquired flatfoot because it is the most common type of flatfoot developed during adulthood. Although this condition typically occurs in only one foot, some people may develop it in both feet. PTTD is usually progressive, which means it will keep getting worse-especially if it isn’t treated early. This differs from flexible flatfoot because flexible flatfoot typically begins in childhood or adolescence and continues into adulthood. It usually occurs in both feet and generally progresses in severity throughout the adult years. As the deformity worsens, the soft tissues (tendons and ligaments) of the arch may stretch or tear and become inflamed. The term flexible means that while the foot is flat when standing (weight bearing), the arch returns when not standing. In the early stages of flexible flatfoot arthritis is not restricting motion of the arch and foot, but in the later stages arthritis may develop to such a point that the arch and foot become stiff. Plantar Fasciitis is actually, in most cases, plantar fasciosis but it’s a bit like pen/biro or hoover/vacuum. The term ‘-itis‘ means ‘inflammation’. This is a term we use for this problem in the early stages of damage because it usually is quite literally an inflammation of part of the plantar fascia. So, what is commonly known as ‘plantar fasciitis’ is really ‘plantar fasciosis’ – a degradation or degeneration of the collagen fibres because of prolonged (most of your adult life) unsustainable stress being applied to the fascia. So, we call it plantar fasciitis but it usually hasn’t been an ‘-itis‘ for years and that is why in many cases anti-inflammatory drugs do not help ease the pain of walking. This is also why most sufferers experience pain first thing in the morning. If inflammation was the source of discomfort then why would it hurt after a nights rest and the good old drugs pumping through your system. Usually, the pain will ease in time. ‘Fascia’ tissue, like ‘ligament’ tissue, heals quite slowly. It may take several months or more to go. However, the following treatments may help to speed recovery. A combination of different treatments may help. Collectively, these initial treatments are known as ‘conservative’ treatments for plantar fasciitis. Rest your foot. This should be done as much as possible. Avoid running, excess walking or standing, and undue stretching of your sole. Gentle walking and exercises described below are fine. Footwear. Do not walk barefoot on hard surfaces. Choose shoes with cushioned heels and a good arch support. A laced sports shoe rather than an open sandal is probably best. Avoid old or worn shoes that may not give a good cushion to your heel. Heel pads and arch supports. 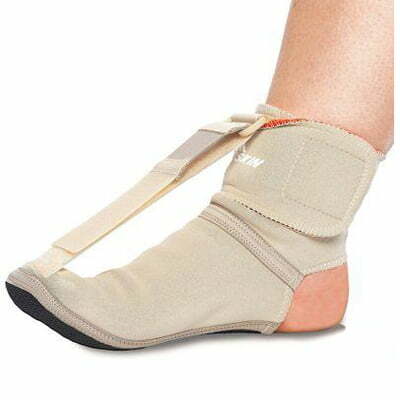 You can buy various pads and shoe inserts to cushion the heel and support the arch of your foot. These work best if you put them in your shoes at all times. The aim is to raise your heel by about 1 cm. If your heel is tender, cut a small hole in the heel pad at the site of the tender spot. This means that the tender part of your heel will not touch anything inside your shoe. Place the inserts/pads in both shoes, even if you only have pain in one foot. Pain relief. Painkillers such as paracetamol will often ease the pain. Sometimes anti-inflammatory medicines such as ibuprofen are useful. These are painkillers but also reduce inflammation and may work better than ordinary painkillers. Some people find that rubbing a cream or gel that contains an anti-inflammatory medicine on to their heel is helpful. An ice pack (such as a bag of frozen peas wrapped in a tea towel) held to your foot for 15-20 minutes may also help to relieve pain. Exercises. Regular, gentle stretching of your Achilles tendon and plantar fascia may help to ease your symptoms. This is because most people with plantar fasciitis have a slight tightness of their Achilles tendon. If this is the case, it tends to pull at the back of your heel and has a knock-on effect of keeping your plantar fascia tight. Also, when you are asleep overnight, your plantar fascia tends to tighten up (which is why it is usually most painful first thing in the morning). The aim of these exercises is to loosen up the tendons and fascia gently above and below your heel. Your doctor may refer you to a physiotherapist for exercise guidance. The causes of lip swelling could range from trauma and contact dermatitis to allergic reactions to certain medical conditions. I am a 44 year old Pe teacher who has been experiencing Back Pain since October. Vinegar has been used as a condiment for several centuries.